De La Rosa has struck out four of the first six hitters -- three with his changeup, one with a fastball that registered at 96. Rios steals second on a terrific jump. He was halfway to second when pitch crossed the plate. 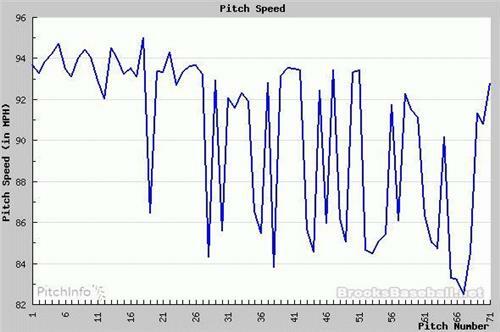 Pitch was an 89 mph fastball. The BABIP gods have withdrawn their support of Daniel Nava. With Nava now hitting .107 with a .167 OBP, one imagines he'll sit Tuesday vs LHP Martin Perez. Bradley is 3-for-6 with RISP and every other Red Sox is 5-for-47. Jackie Bradley Jr. 2-for-2 with both the Red Sox's RBIs. He keeps playing like this it's going to be tough to send him down. Called strike on A.J. Pierzynski, his third of the season. Rangers tie it up on Moreland sac fly (Sizemore with a nice diving catch to prevent another run). Lack Ks Murphy to get out of the inning. Umps will review the safe call here. Andrus had the catch for a while before losing it on the transfer at second. A nice 1-2-3 top of the first for Lackey to get things started. 1-2-3 inning on 10 fastballs for John Lackey.